The best concealer for dark under eye circles is one that looks natural, yet provides the coverage you need to disguise the circles. Covering problematic darkness under the eyes can boost your confidence and help you look your best. MAC Studio Finish Concealer: MAC is a well-known and loved brand of makeup. This professional cosmetic company offers several concealers, but the Studio Finish provides opaque coverage and is water-resistant, making it a good pick for under the eyes. Dermablend Quick Fix Concealer: This professional-grade product is a lightweight but high-coverage product recommended for highly problematic areas, such as dark under eye circles. Clé de Peau Beauté Concealer: If you want to look as good or Jessica Alba or Megan Fox, this celebrity makeup artist favorite might do the trick. This long-lasting concealer is one of the pricier concealers, but it offers outstanding, long-lasting coverage. Yves St. Laurent Touche Eclat: This popular product highlights the under eye area to disguise darkness and create a youthful glow. Time Balm: This reasonably-priced product not only conceals, but has ingredients designed to protect and nourish the under eye skin. Laura Mercier Secret Camouflage: This concealer duo, voted Best of Beauty Editors' Choice from Allure Magazine, glides on and provides a double whammy of concealing and brightening power. Bobbi Brown Creamy Concealer: Voted a "Best Beauty Buy" from InStyle Magazine, Bobbi Brown Creamy Concealer doesn't dry out the under skin, but yet camouflages circles extremely well. These eight products are some of the most well-respected in the world of under eye concealers, but there are many more, too. Shop your favorite brands, get recommendations from your local department store makeup counter, and reader reviews to find the brand that is best for you. Substantial coverage: A lightweight, thin concealer may not do the trick. More opaque products will provide the thicker coverage for this condition. Moisturizing or nourishing: A product that is drying may conceal darkness, but will emphasize any lines. Fade- and crease-resistant: You want your concealer to last all day, so your circles aren't showing by your afternoon coffee break. 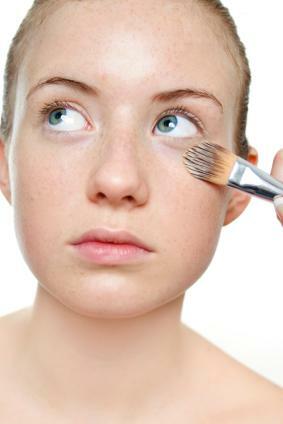 Smooth and easy to blend: If you have to rub or pull to blend the product, it can be damaging to the eye area. Brightening: Products that deflect light from under the eyes will disguise the problem even better. Choosing the best shade or color of concealer can be slightly tricky. The area under the eyes is naturally a bit lighter, but going with a color that is too light can result in a 'raccoon-eye' type effect. This effect draws more attention to the area and does not blend in well. Going too light also draws more attention to any imperfections in the area. A good rule of thumb is to try a concealer that is somewhat lighter than your skin tone, but not more than two shades lighter. In general, a yellow-based product will help to counteract the darkness, which is often blue or purplish in color.